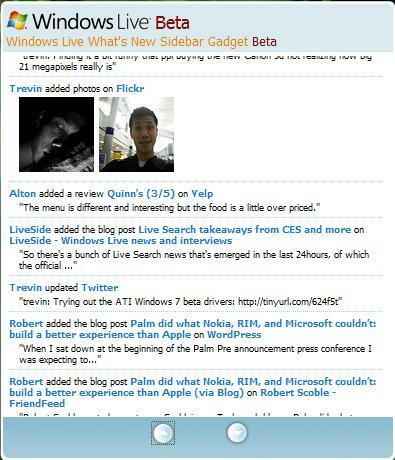 Since we released the latest version of the Windows Live what's new feed which shows what's been going on with your social network at http://home.live.com, we've gotten repeated asks to provide a Windows Vista gadget so people can keep up with their social circle directly from their desktop. You asked, and now we've delivered. Get it from here. What I love most about this gadget is that a huge chunk of the work to get this out the door was done by our summer interns from 2008. I love how interns can be around for a short time but provide a ton of bang for the buck while they are here. Hope you enjoy the gadget as much as I have.